The California tunnel company run by Elon Musk is continuing to maintain a presence at the Thai cave where several boys and their soccer coach are awaiting rescue. A spokesman for Boring Co. said Sunday that the company has four engineers who are "offering support in any way the government deems useful." Musk tweeted early Saturday that he was working with a team from his Space X rocket company to build a "tiny kid-size submarine" to transport the children. But Saturday night, he tweeted that the cave was now closed for the rescue by divers. "Will continue testing in LA in case needed later or somewhere else in the future," he wrote. The official heading the operation to rescue 12 boys and their soccer coach from a cave in northern Thailand says the operation is going "better than expected." Chiang Rai provincial acting Gov. Narongsak Osatanakorn made the comment at a news conference Sunday evening after rescuers extracted four of the boys from the cave where they had been trapped for more than two weeks. Narongsak said the four were then taken to a hospital. Their condition was not immediately clear. Narongsak said the healthiest have been taken out first, and the next phase of the operation would start in 10-20 hours. He said that 13 foreign and five Thai divers were taking part in the rescue and that two divers would accompany each boy as they're gradually extracted. Thai navy SEALs say rescuers have taken four members of a youth soccer team out of the cave where they had been trapped for more than two weeks, part of an operation to rescue the 12 boys and their coach. Chiang Rai province acting Gov. Narongsak Osatanakorn, who is heading the operation, said that 13 foreign and five Thai divers were taking part in the rescue and that two divers would accompany each boy as they're gradually extracted. The operation began at 10 a.m. Shortly before 8 p.m., the SEALs reported on their official Facebook page that four had been rescued. 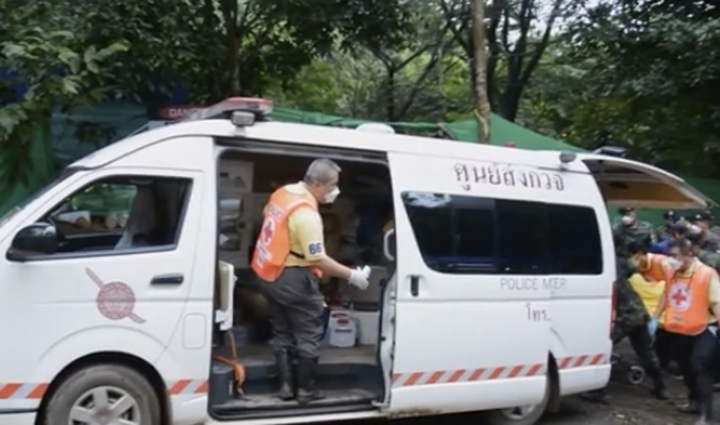 Two ambulances have left from a cave in northern Thailand, hours after an operation began to rescue 12 youth soccer players and their coach. The ambulances were seen Sunday evening, but it was unclear who was inside them. Chiang Rai province acting Gov. Narongsak Osatanakorn, who is heading the operation, said earlier Sunday that 13 foreign and five Thai divers were taking part in the rescue and two divers will accompany each boy as they're gradually extracted. He said the operation began at 10 a.m., and it will take at least 11 hours for the first person to be taken out of the cave. Thai authorities say it is unknown when the first group of boys trapped in a flooded cave will begin their dive out of the cave, the key part of a rescue operation underway. In a statement released late Sunday afternoon, Chiang Rai acting Gov. Narongsak Osatanakorn says "divers will work with medics in the cave to assess the boys' health before determining who will come out first." He added: "They cannot decide how many of them will be able to come out for the first operation. Based on the complexity and difficulty of the cave environment it is unknown how long it might take and how many children would exit the cave." The rescue operation began at 10 a.m. Sunday when expert divers entered the cave. Trips from the entrance to where the team is trapped and back to the entrance take about 11 hours. The Thai navy SEALs, who have been spearheading the rescue effort for the 12 boys and their soccer coach, have posted a photo on their Facebook page with a vow to bring the trapped team home from a flooded cave. The unit says in a message: "We, the Thai team and the international team, will bring the Wild Boars home." That's the name of the young boys' team. The risky diving operation to bring them out has started and the first boy is expected to be out of the cave around 9 p.m. Sunday (10 a.m. ET) at the earliest. Rescuers say it may take 2-4 days for the entire team to reach safety, depending on conditions inside the cave. The local governor in charge of the rescue says the mission was launched Sunday morning because floodwaters inside the cave are at their lowest level in days and rains forecast to hit the region risk flooding the cave again. 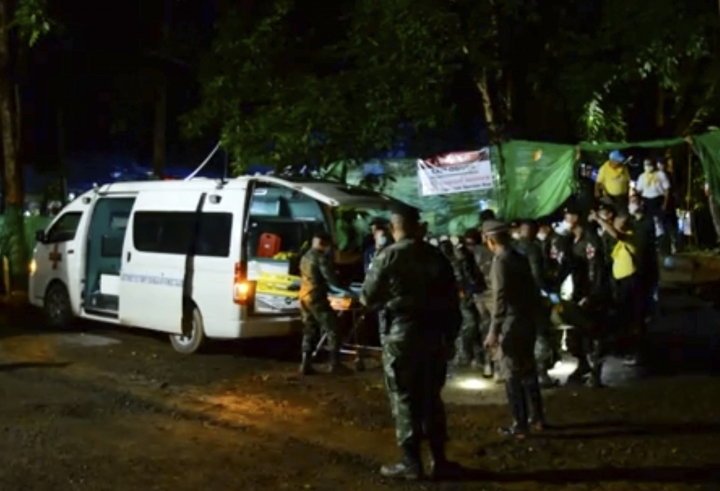 A Thai army commander says the ongoing rescue of 12 boys and their coach could take 2-4 days depending on conditions inside the partially flooded cave. According to Maj. Gen. Chalongchai Chaiyakam, the 13 "will continuously come out in approximately 2-4 days, which all may change depending on weather and water conditions." The governor in charge of the operation says two divers will accompany each boy as they are gradually extracted. The operation began at 10 a.m. and he said it would take at least 11 hours for the first person to be rescued. The Thai official in charge of the rescue of 12 boys and their soccer coach says they're physically ready and mentally determined for their extraction now underway from a partially flooded cave. Chiang Rai acting Gov. Narongsak Osatanakorn says 13 ambulances and helicopters in two separate locations are ready to transport them to hospitals. The first is expected to reach safety at 9 p.m. Sunday (10 a.m. ET) at the earliest. He says: "If we keep on waiting and the rains come in the next three or four days, our readiness will decrease." He also says the families of the boys have been informed about the risky mission. A Thai governor says the operation to bring out 12 schoolboys and their soccer coach from deep inside a cave where they have been trapped for two weeks has begun. The acting Chiang Rai governor has told reporters "today is D-Day" with 13 foreigner and five Thai divers taking part in the rescue. He says the divers went in at 10 a.m. and the boys will gradually come out accompanied by two divers each. He says the earliest they will come out is 9 p.m. Sunday (10 a.m. ET). The only way to bring them out is by navigating dark and tight passageways filled with muddy water and strong currents, as well as oxygen-depleted air. 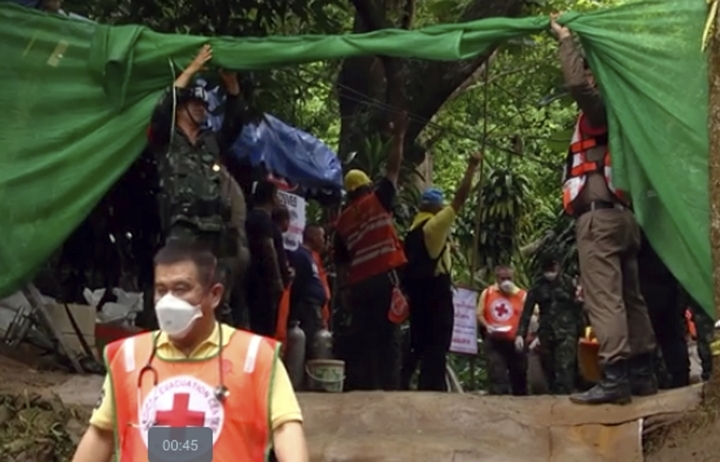 Thai authorities have asked media to leave the area around the entrance of the cave where 12 boys and their soccer coach have been trapped for two weeks, fueling speculation that a rescue mission could be imminent. Dozens of divers have arrived at the cave on Sunday morning. Thai officials said Saturday they are worried that heavy monsoon rain could soon make the job even more difficult and they may need to quickly rescue the boys and the soccer coach from a partially flooded cave by helping them make risky dives to safety. The boys, ages 11-16, and their 25-year-old became stranded when they went exploring in the cave after a practice game. Monsoon flooding cut off their escape and prevented rescuers from finding them for almost 10 days.